This Huss and Dalton is in excellent condition and is one of the most versatile guitars a person can find. The tone is extremely well balanced and the playability is fantastic. Like the MJ, the cutaway version is 16″ across, but this guitar is built at 4 1/2″ deep. 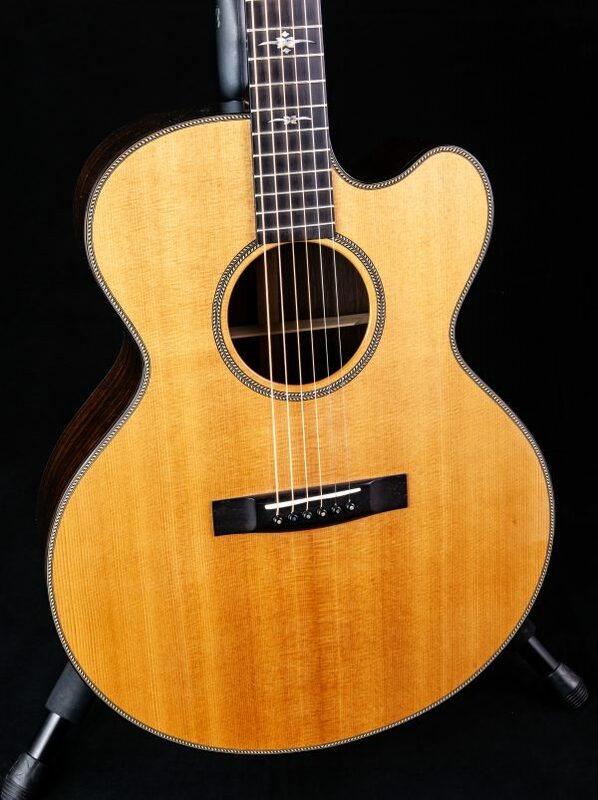 Its standard woods are either Indian rosewood or mahogany back and sides with a Sitka spruce top. Its size and build contribute to a balanced sound that covers a lot of ground. Features include our Stingray inlays, Indian rosewood bindings, and half-herringbone rosette and purfling. With the reach of a cutaway and the power of the body style, the MJC could be your companion of a lifetime.